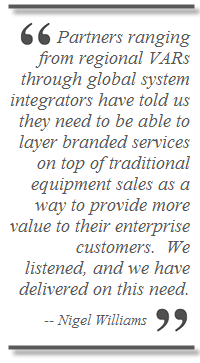 Partners ranging from regional VARs through global system integrators have told us they need to be able to layer branded services on top of traditional equipment sales as a way to provide more value to their enterprise customers. We listened, and we have delivered on this need. Today we officially unveiled some important changes to our award-winning BizConnect program. These changes are aimed at empowering our partners to aggressively compete in a rapidly evolving enterprise marketplace while strengthening the value of the Ciena brand for our channel. These changes open new doors to business growth, provide our partners with more profit opportunity, and serve to underline our continuing commitment to our partners’ success. A key aspect of this BizConnect program evolution is a new focus on enabling our Solution Provider partners to provide a more robust and complete package of services for their enterprise clients. I believe that these changes will benefit our partners immediately and in the long run, and will not only result in a better relationship between ourselves and our partners, but also strengthen our partners’ relationships with their customers and their own profitability. Historically, our Solution Providers have supplied enterprises with connectivity solutions and equipment, but the ongoing service and support contracts for these enterprise customers have been maintained directly by Ciena. With market forces putting increasing pressure on CPE margins, we’ve heard from many of you that this is not a sustainable model. To address this challenge, we’ve now enabled our Solution Provider partners to offer Ciena-branded services directly to their enterprise customers, opening up new revenue streams and opportunities for higher margins. To accomplish this, we’ll work closely with our Solution Providers that sell Ciena services by providing support, training, lab equipment, evaluations, certifications, existing customer upsell opportunities, new customer acquisition and more as they ramp up their own capabilities. To illustrate how this works, imagine a Solution Provider that has secured an enterprise client that wishes to receive ongoing service support. The Solution Provider may initially only handle install and first line maintenance services and then pass escalated services onto Ciena. As they mature and become certified on additional Ciena services, Solution Providers can start handling both first and second line support, only passing support onto Ciena for very specific troubleshooting at level three. Eventually, we see some of our Solution Providers becoming fully self-sufficient to handle all service contracts for enterprise clients. The introduction of Ciena-branded partner services comes with another essential improvement to our BizConnect program. We know that strengthening our marketing support is a crucial part of our partners’ success, and you will see a noticeable increase in our efforts here, not just at the product marketing level but also in positioning and monetizing services. We are making key investments to deliver more advanced and vertically focused content, while also increasing our focus on lead generation. In essence, we’re maintaining our leadership position in technology as the network specialist, and we’re adding marketing specialist to our credentials. With the rollout of these new changes, as well as many others that we’ve detailed on our Partner Portal, we are aligning our BizConnect program to the evolving needs of our Solution Provider partners. Our confidence in these partners is strong, and we look forward to our continued journey of mutual growth, profitability and commitment. In my next post, I will detail some of the changes to our BizConnect program that are directed to our carrier and managed service provider (MSP) partners. Until then, thanks for partnering with Ciena. We’re happy to welcome you if you are a new partner (click here to learn more), and as always I welcome your candid feedback as we evolve the program to fit your needs.